Military historians constantly refer to “Aces” as being military aviators credited with shooting down five or more enemy planes during aerial combat. Most of these historians don’t actually know the name of the first ETO fighter ace. 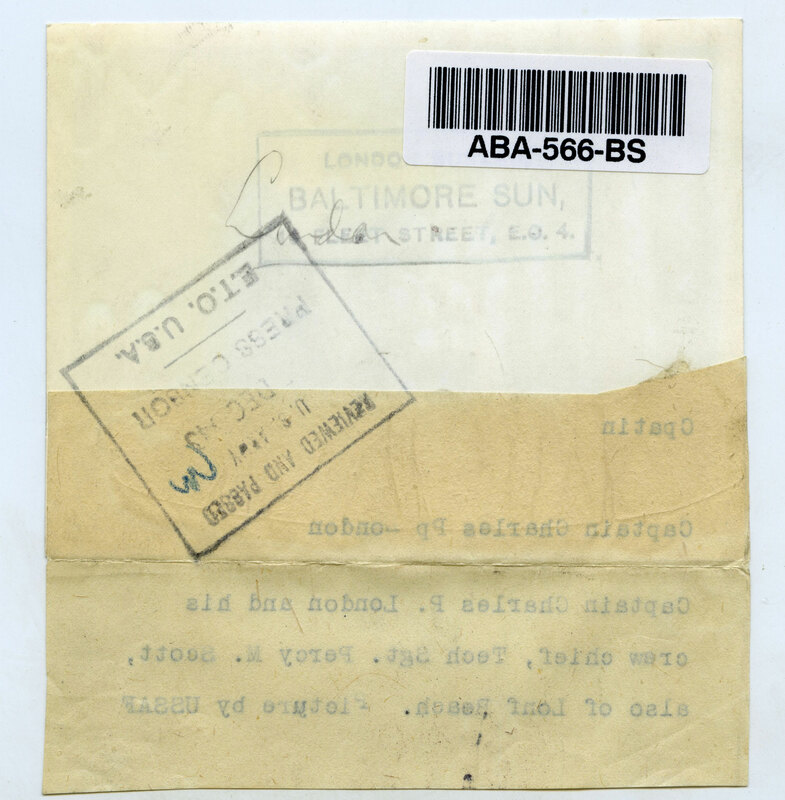 I was only made aware of his story while researching a recent photograph acquisition through an internet source who acquired the wartime collection of the Baltimore Sun newspaper. All priced at US $15.00, the shots made available for resale were mostly unnamed or impossible to research. When I saw that this shot was well identified, dated, cross referenced and well taken, I was “quick to click” and make the purchase. Captain London is identified standing in front of his plane with his Crew Chief Sgt. Percy M. Scott cut off from the photo, yet identified in the caption. The photo was acquired by the Baltimore Sun from the USAAF(sic in caption). The photo is a typical standard size shot typical of the USAAF during the war. The shot is crisp, clear and was printed directly from the original negative in 1943. This isn’t a shot produced in later years for a book, publication, or film. First fighter pilot in the ETO to become an ace. Capt. 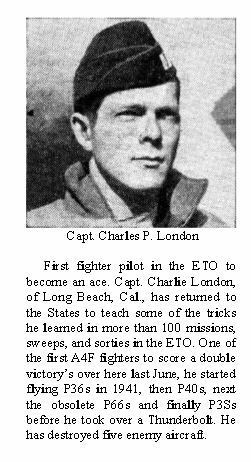 Charlie London, of Long Beach, Cal., has returned to the States to teach some of the tricks he learned in more than 100 mission, sweeps, and sorties in the ETO. One of the first A4F fighters to score a double victory’s over here last June, he started flying P-36’s in 1941, then P-40’s, next the obsolete P-66 and finally P3Ss before he took over a Thunderbolt. He has destroyed five enemy aircraft. (Citation Needed) – SYNOPSIS: Captain (Air Corps) Charles P. London (ASN: 0-421260), United States Army Air Forces, was awarded the Distinguished Service Cross for extraordinary heroism in connection with military operations against an armed enemy while serving as Pilot of a P-47 Fighter Airplane in the 83d Fighter Squadron, 78th Fighter Group, EIGHTH Air Force, in aerial combat against enemy forces from 22 June 1943 through 30 July 1943. On 22 June while engaged in aerial combat, Captain London shot down an enemy airplane. On 29 June Captain London shot down two enemy aircraft in a single engagement. 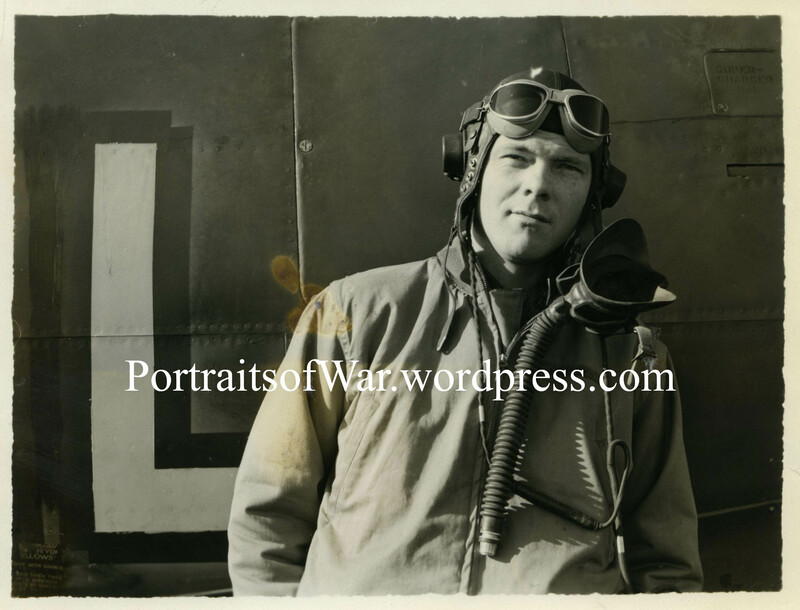 When, on 30 July 1943, Captain London again shot down two enemy aircraft in a single engagement, bringing his total to five victories for the period, he became the first American ACE in the European Theater of Operations. Captain London’s unquestionable valor in aerial combat is in keeping with the highest traditions of the military service and reflects great credit upon himself, the 8th Air Force, and the United States Army Air Forces.